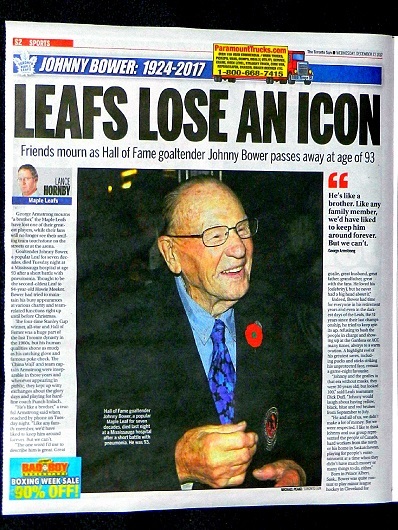 TORONTO (Dec. 28) — When his mobile device started “going haywire” late Tuesday afternoon, Bobby Orr figured something awful had happened; his premonition verified with news of Johnny Bower’s death. 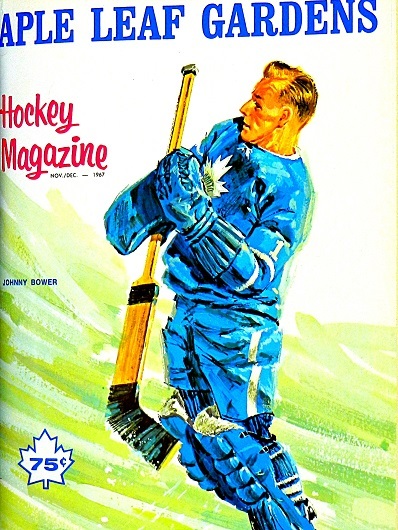 Orr, who will turn 70 in March, was working his way up the minor and junior hockey ladder when Bower helped the Toronto Maple Leafs win consecutive Stanley Cup titles in 1962, 1963 and 1964. 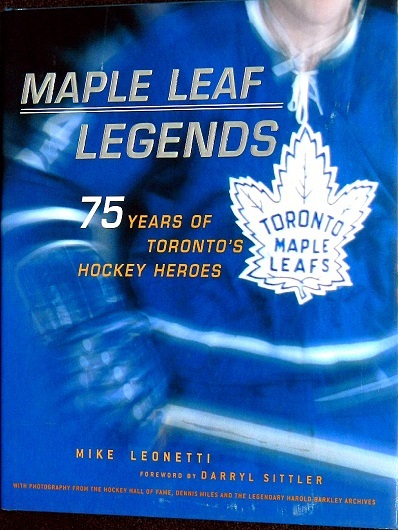 He joined the Boston Bruins, at 18, for the 1966–67 National Hockey League season and watched the Leafs win a fourth championship. 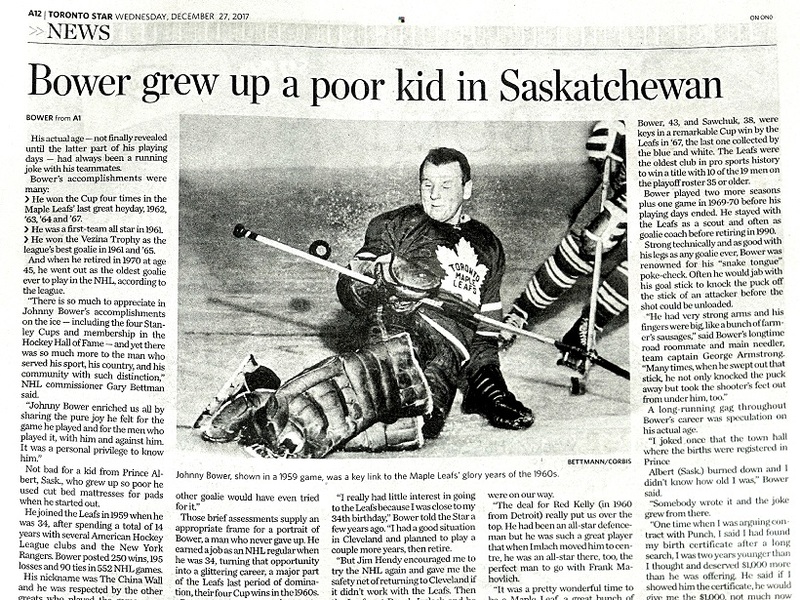 Orr remembers marveling at the goalie he had viewed on television in his teenage years. 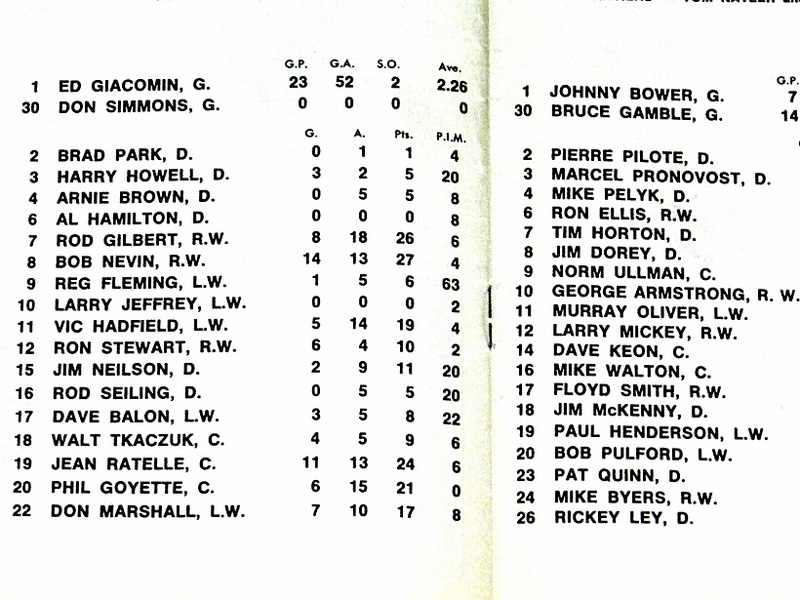 Bower wasn’t in the Toronto line–up when Orr made his first visit with the Bruins to Maple Leaf Gardens. 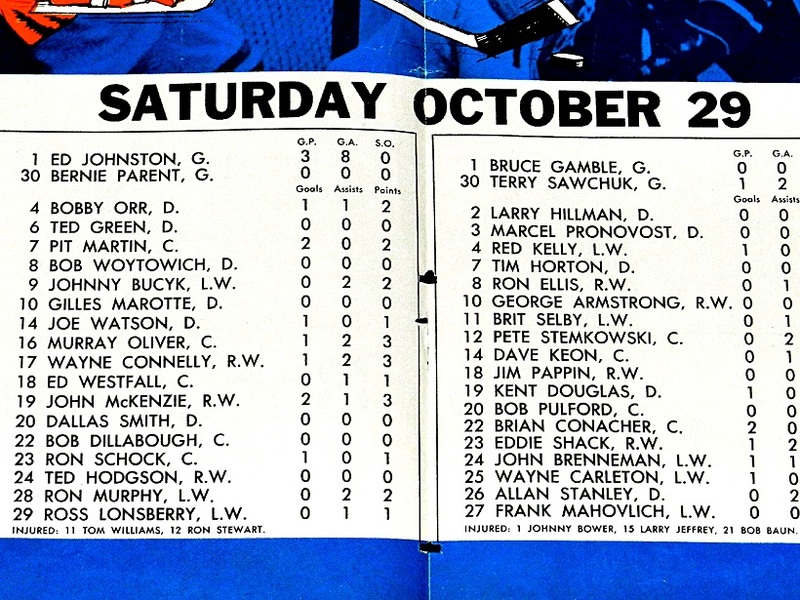 Bruce Gamble and Terry Sawchuk dressed on Oct. 29, 1966 — a 3–3 tie — in Orr’s fourth NHL game. 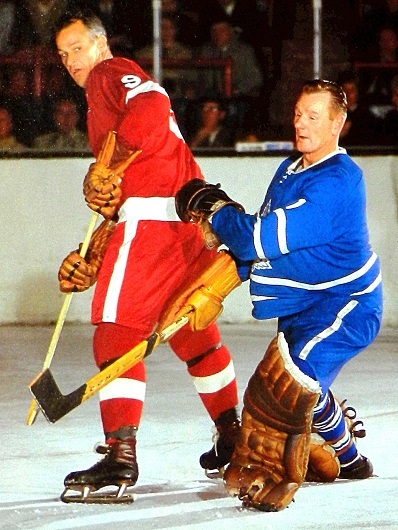 But, the unparalleled defenseman instantly grew to respect with ageless goalie. 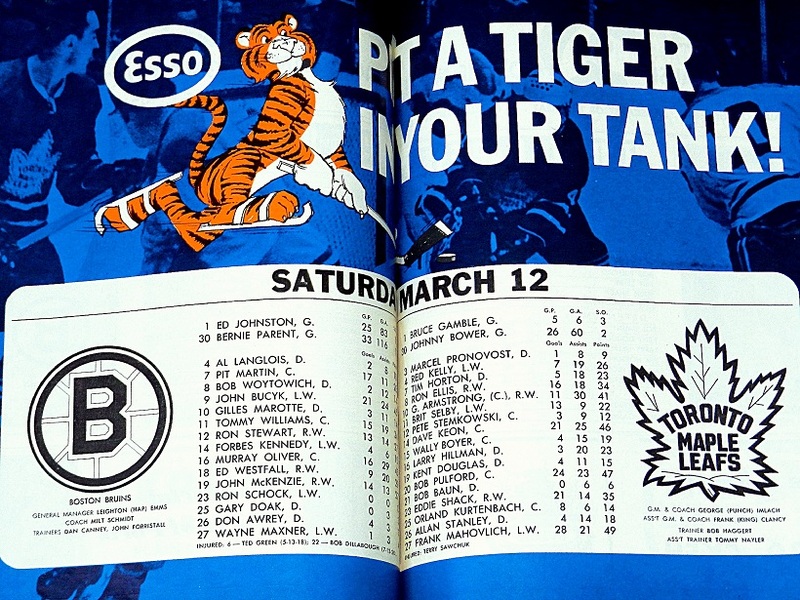 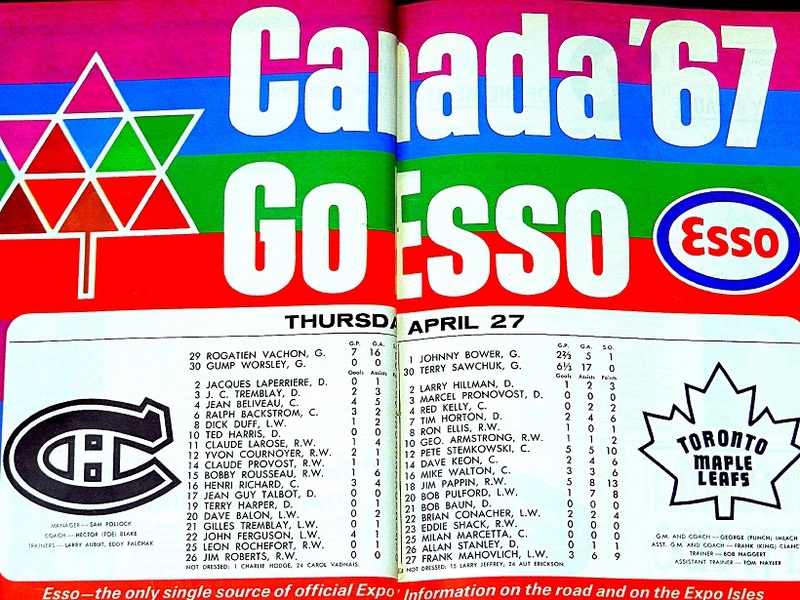 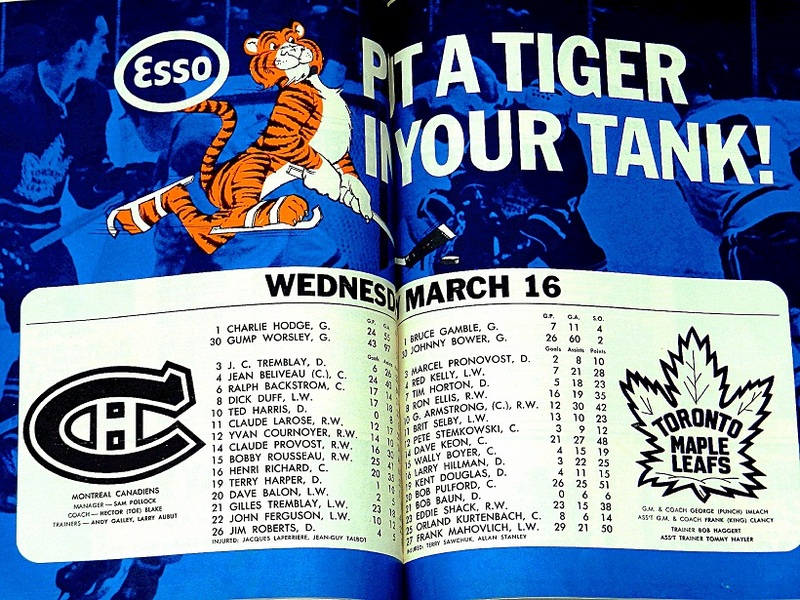 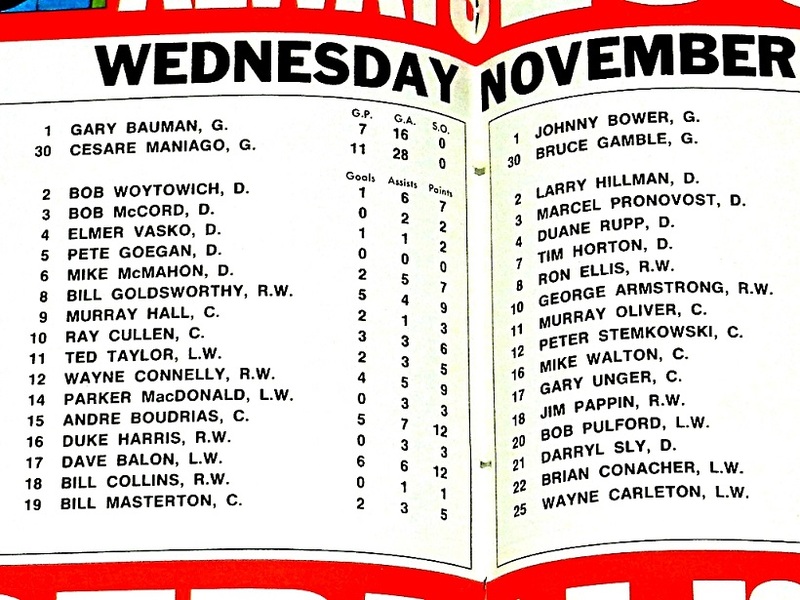 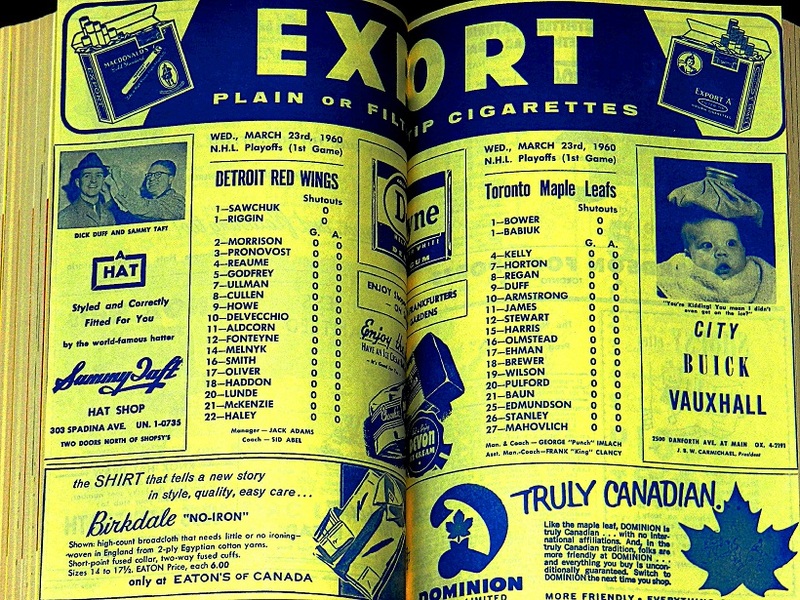 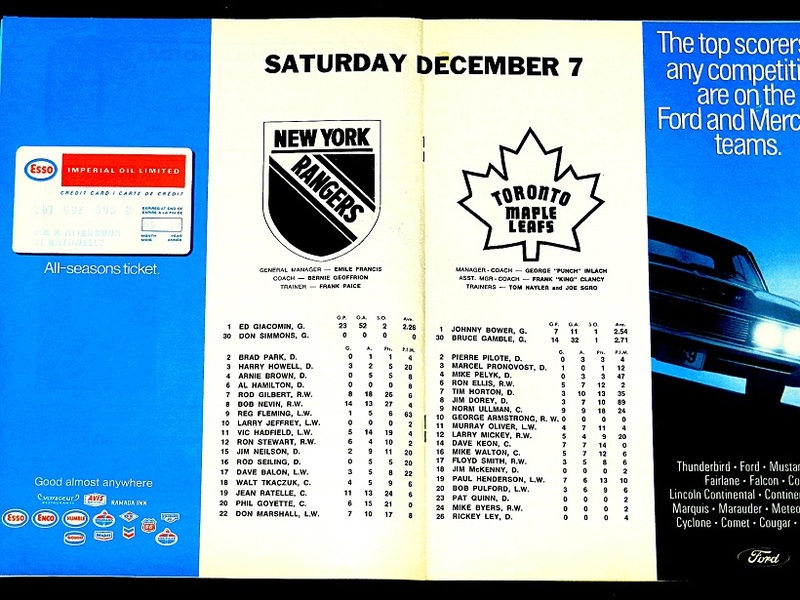 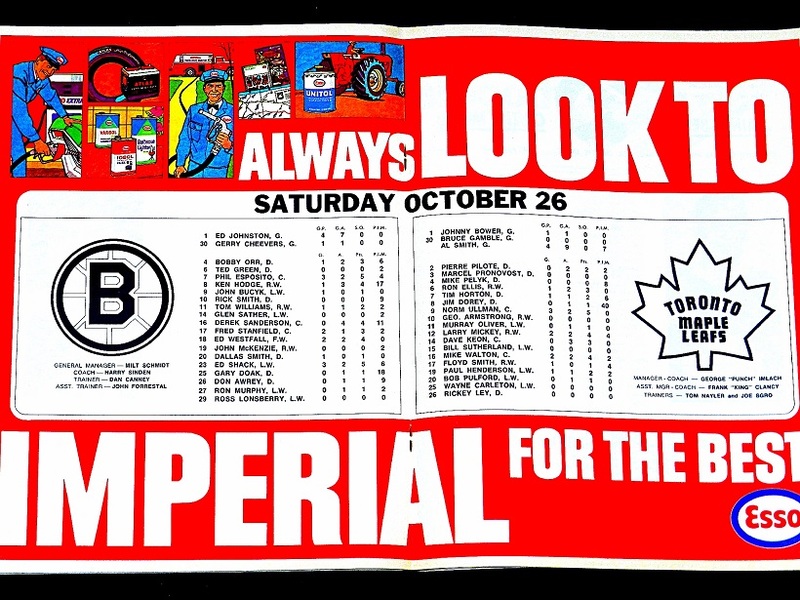 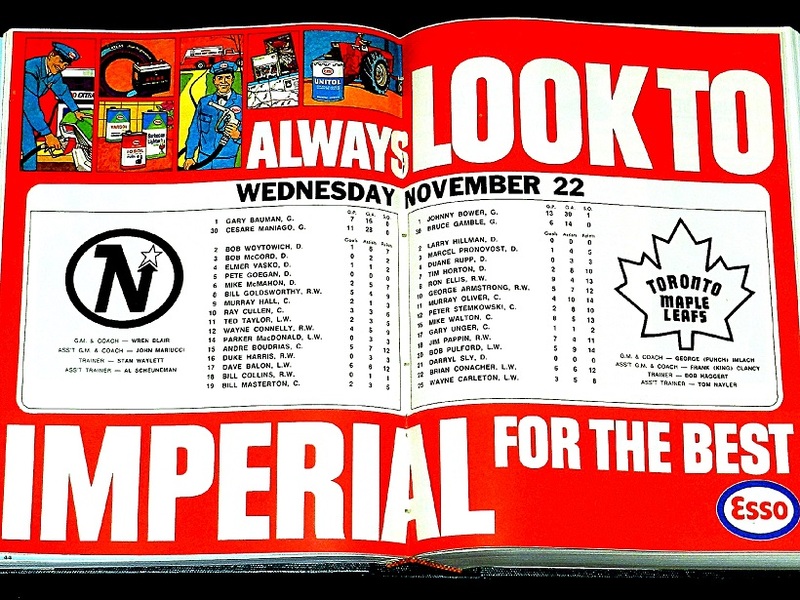 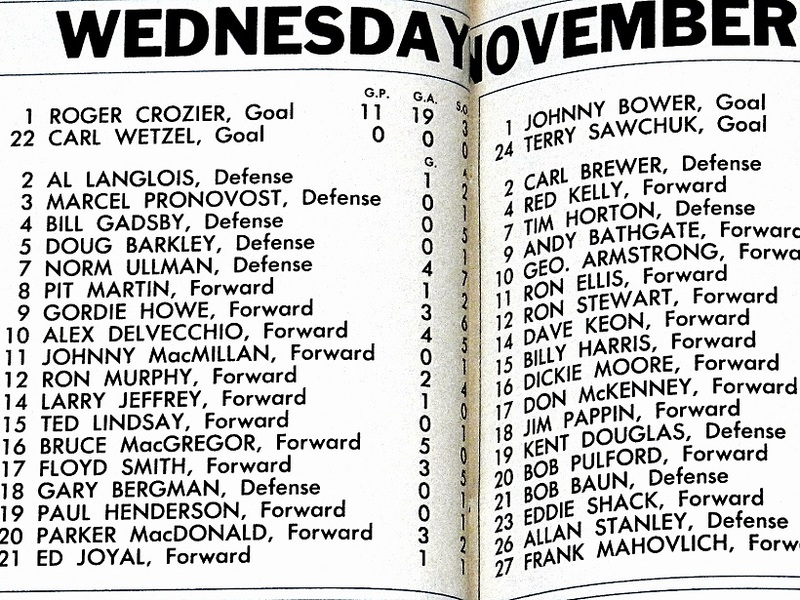 PROGRAM LINE–UPS FROM BOBBY ORR’s FIRST NHL GAME AT MAPLE LEAF GARDENS. 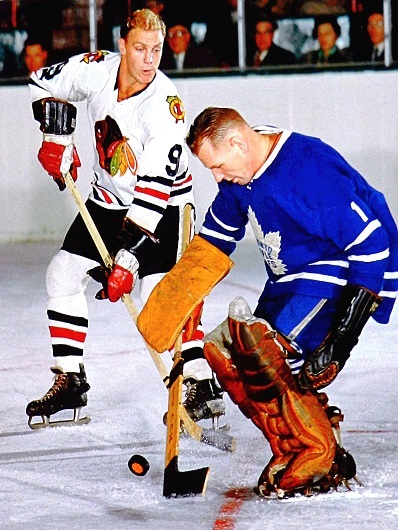 TRYING TO SCORE ON JOHNNY BOWER AT THE BOSTON GARDEN. 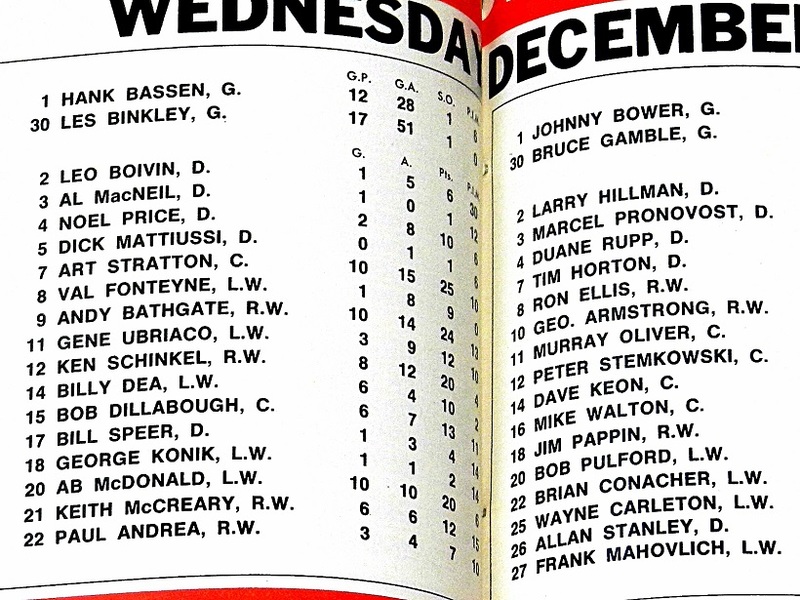 RED KELLY (4) AND BOB BAUN (21) ARE THE OTHER TORONTO PLAYERS. 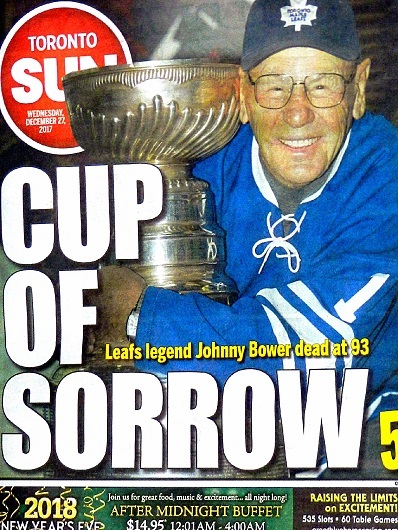 Orr, currently a player agent, got a kick out of Bower’s quiet sense of humor. 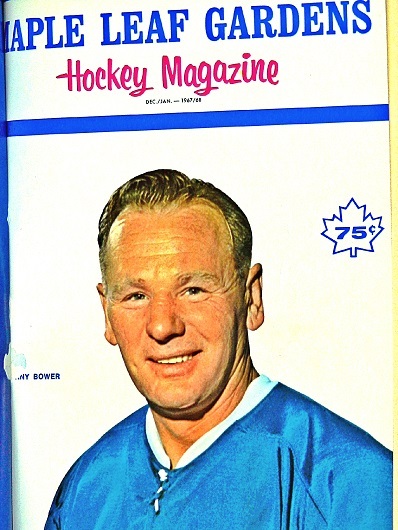 The question I posed to Johnny Bower was largely rhetorical, for I certainly knew the answer. 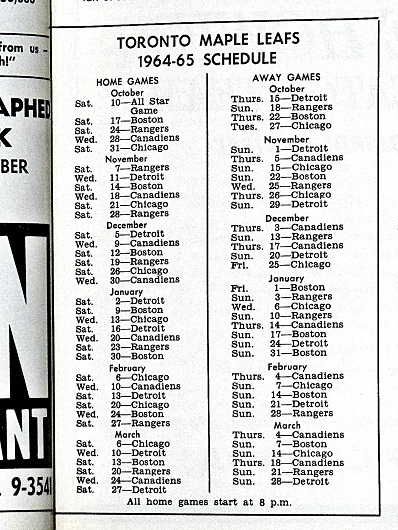 Or, so I figured. 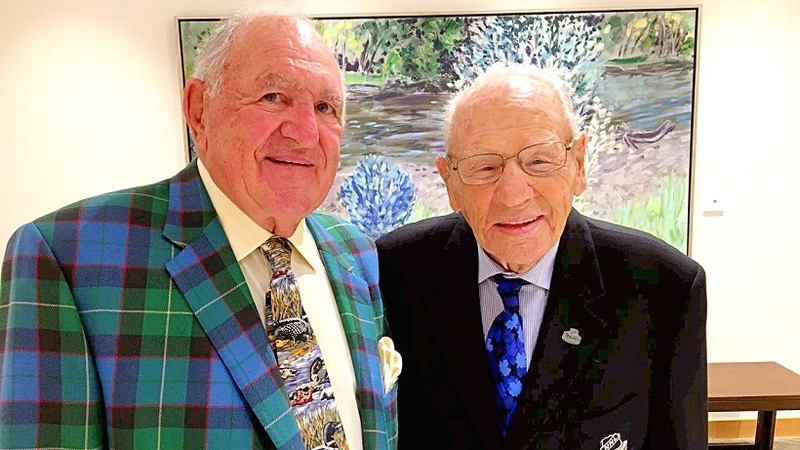 BEST FRIENDS BOB BAUN (LEFT) AND JOHNNY BOWER PHOTOGRAPHED, ABOVE, AT BOWER’S 93rd BIRTHDAY CELEBRATION IN NOVEMBER. 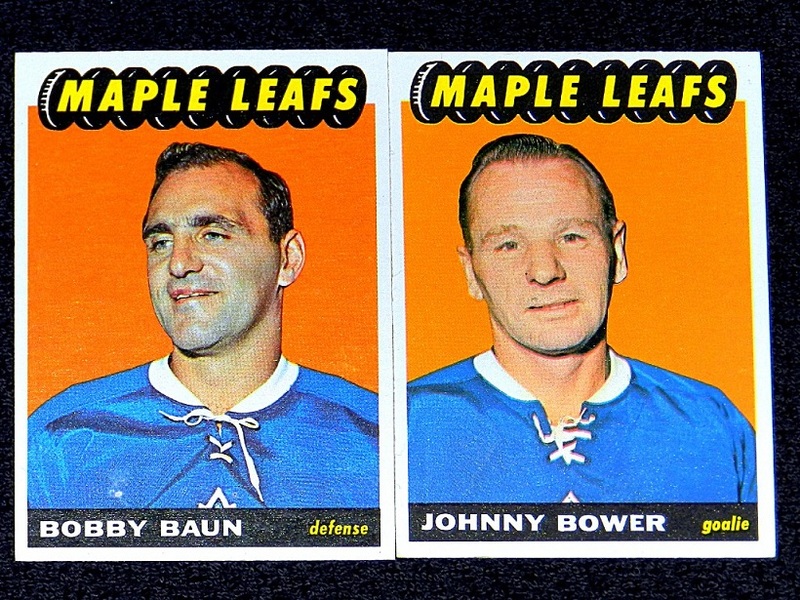 AND, BELOW, IN THEIR TOPPS 1965–66 HOCKEY CARDS. 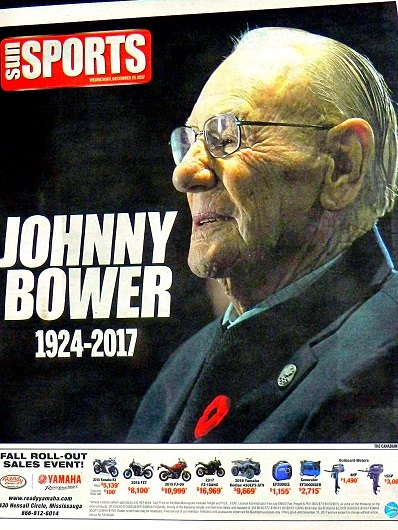 As to why he and Bower gravitated toward one another in more–recent years, Baun has several theories. 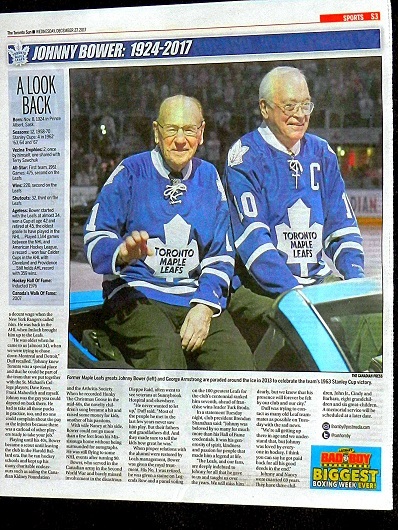 “First of all, we were a couple of old guys from Saskatchewan,” he chuckled. 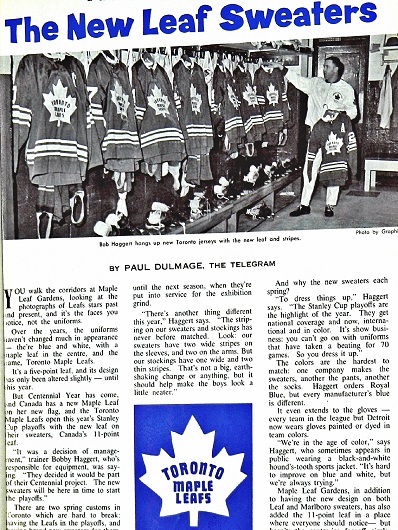 “So, we had that in common. 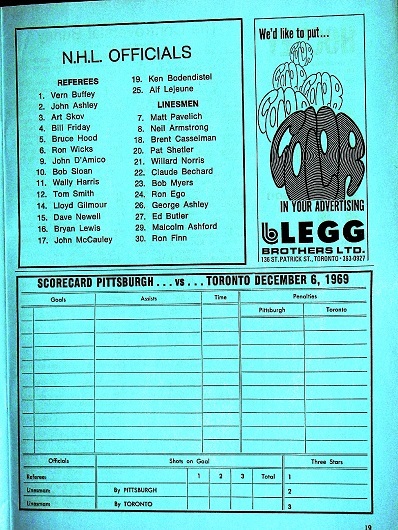 But, we also just loved having long conversations about those great Leaf teams in the 1960’s. 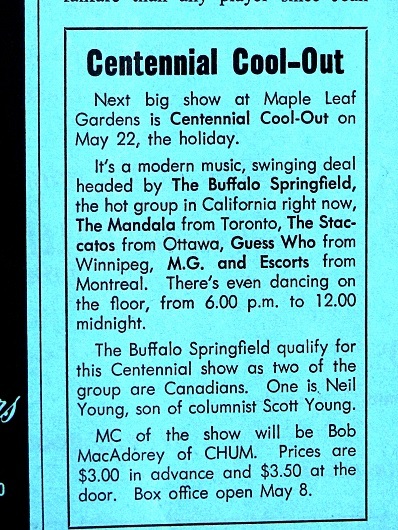 For whatever reason, that era seemed to grow in importance to me and John as we got older. 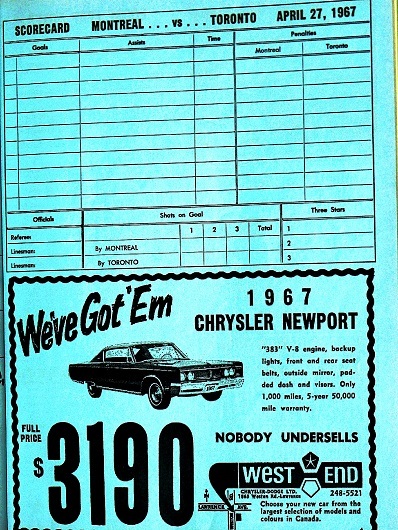 We could sit on the phone for hours and tell old stories. 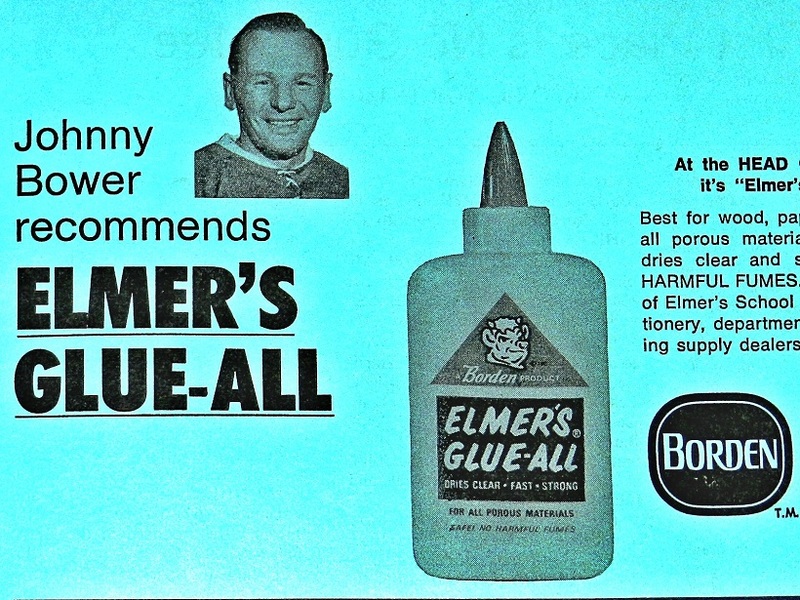 He and Nancy were such a beautiful, warm couple. 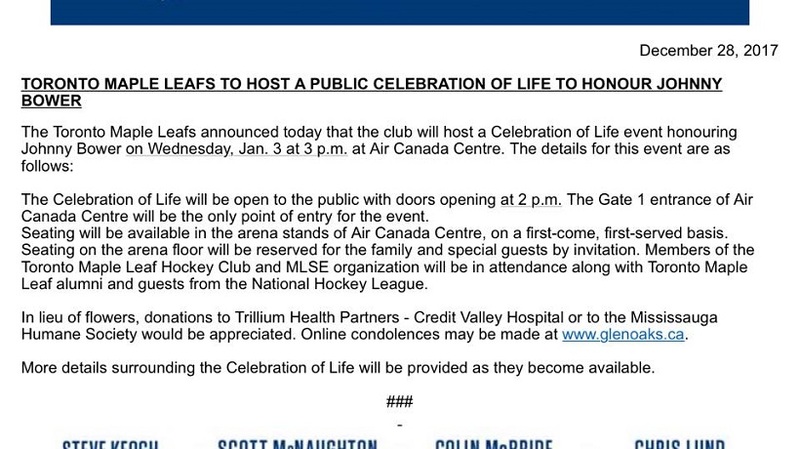 Sallie and I loved spending time with them. 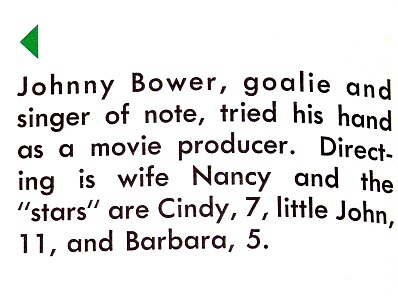 I can only imagine how heartbroken Nancy is today after nearly 70 years of marriage. 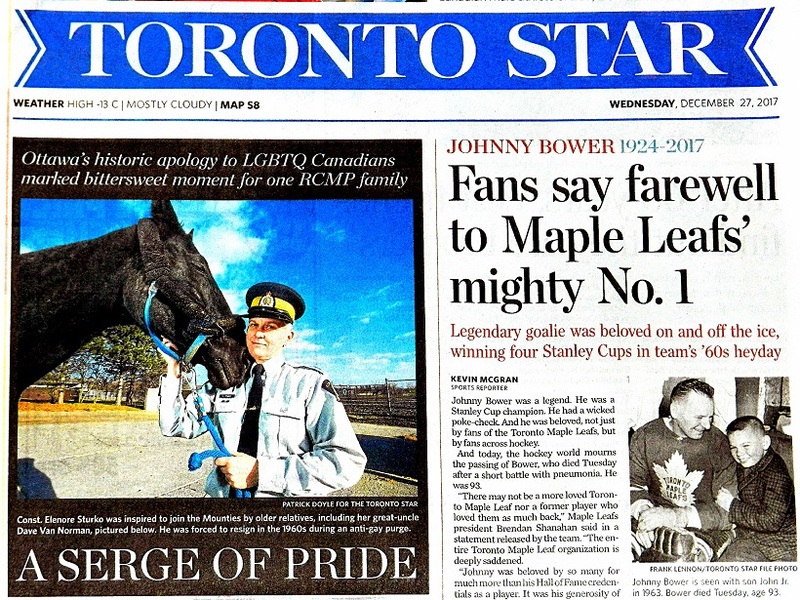 IN 2006, BOWER TEAMED WITH WINDSOR STAR SPORTS COLUMNIST (AND TORONTO NATIVE) BOB DUFF TO WRITE HIS MEMOIR (TOP–LEFT). 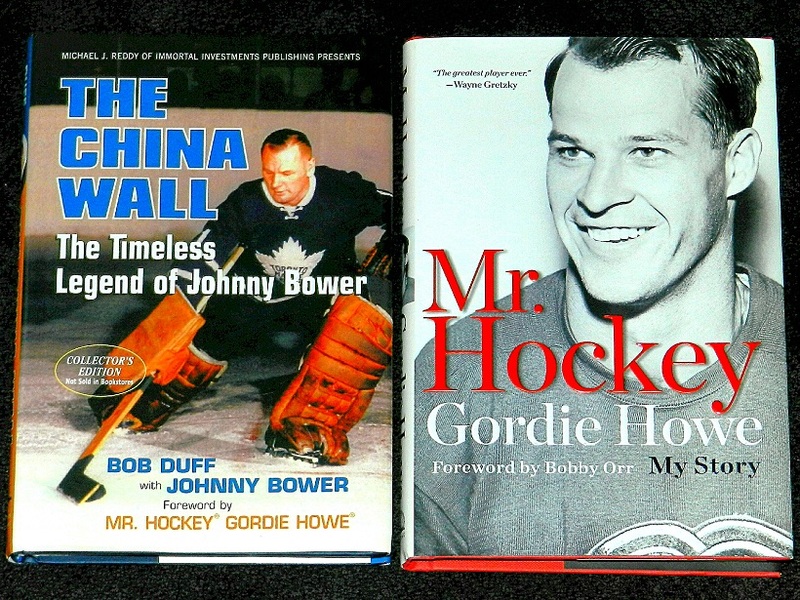 THE FOREWORD WAS PENNED BY BOWER’S CLOSE SASKATCHEWAN PAL AND FORMER NHL RIVAL GORDIE HOWE, WHO WROTE HIS OWN AUTOBIOGRAPHY (TOP–RIGHT) IN 2014. 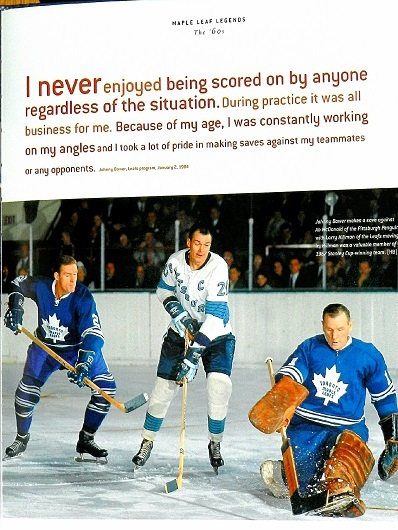 MR. HOCKEY DIED ON JUNE 10, 2016. 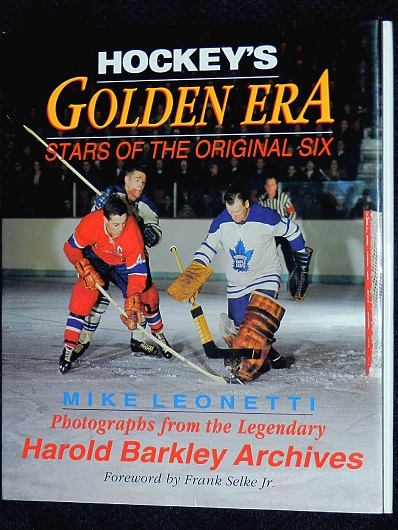 THE LATE MIKE LEONETTI, WHO DIED JUST MORE THAN A YEAR AGO, PRODUCED A TERRIFIC SERIES OF BOOKS AFTER PURCHASING HAROLD BARKLEY’S ICONIC COLLECTION. 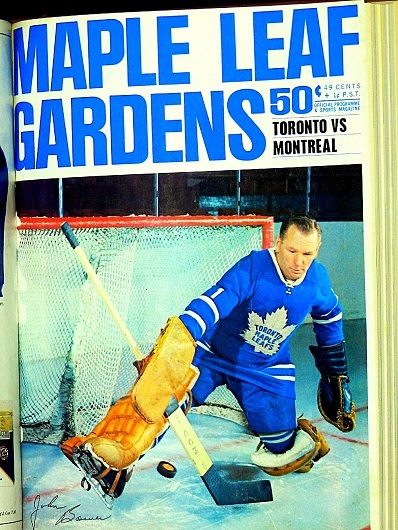 BARKLEY WAS HOCKEY’S FIRST — AND BEST — COLOR PHOTOGRAPHER; MANY OF HIS IMAGES FROM THE 1960’s AND 70’s ARE WIDELY IN USE TODAY. 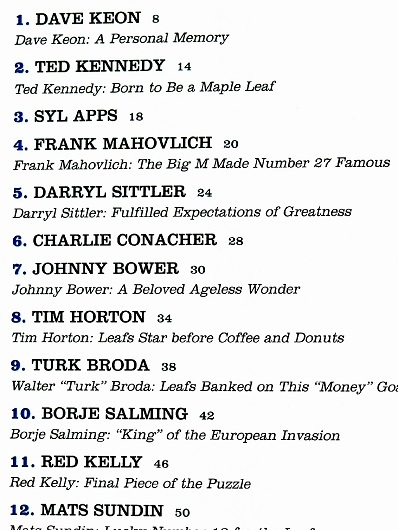 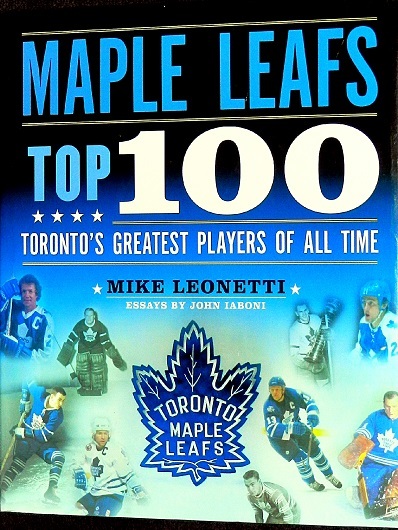 IN MIKE’S 2007 BOOK (ABOVE AND BELOW) ON THE TOP 100 MAPLE LEAFS OF ALL TIME (I WAS HONORED TO BE PART OF THE SELECTION PANEL), BOWER RANKED NO. 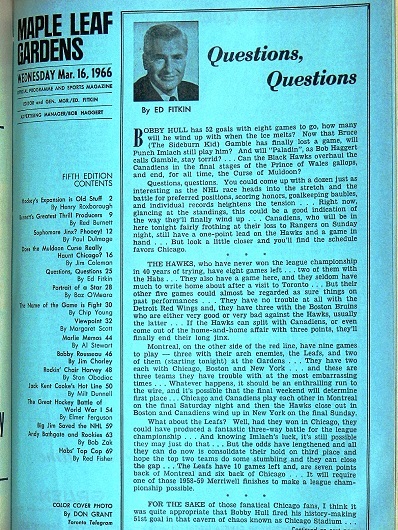 7, AS HE DID LAST YEAR WHEN THE CLUB NAMED ITS TOP 100 PLAYERS AS PART OF ITS CENTENNIAL COMMEMORATION. 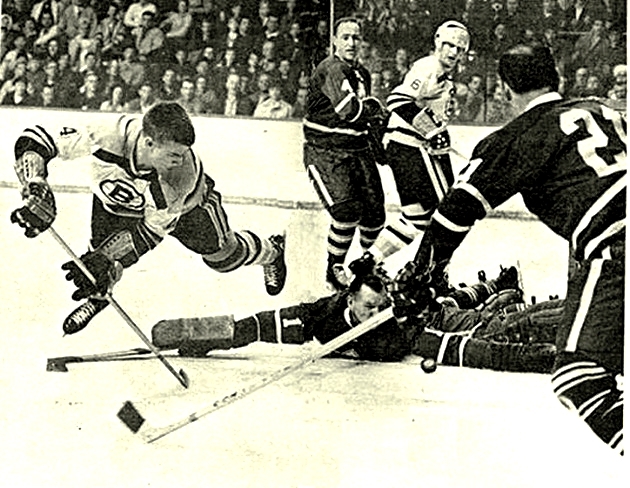 BOWER, CAPTURED BY THE LENS OF HAROLD BARKLEY WHILE BEING HOUNDED BY TWO OF HIS GREATEST HOCKEY RIVALS — BOBBY HULL (TOP–LEFT) AND GORDIE HOWE (RIGHT). 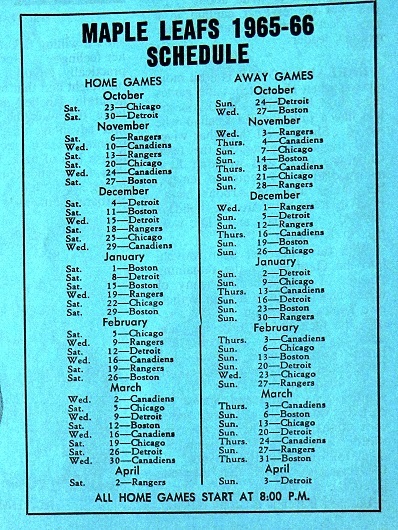 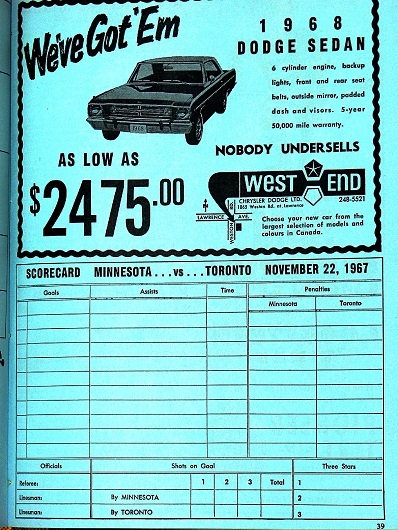 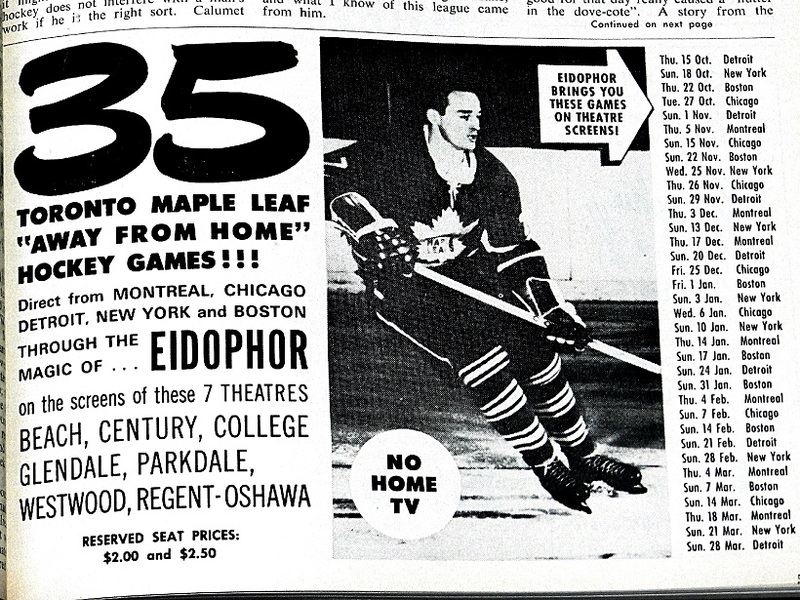 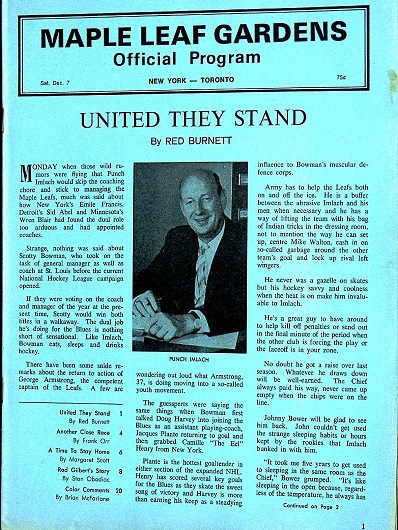 LEAF ROAD GAMES IN 1964–65 WERE SHOWN EXCLUSIVELY IN TORONTO–AREA MOVIE THEATERS. 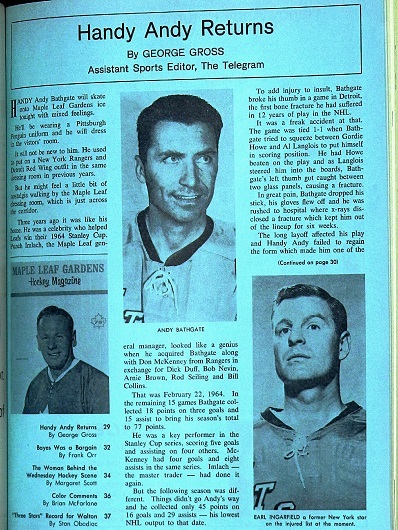 DEFENSEMAN AL LANGLOIS WORE NO. 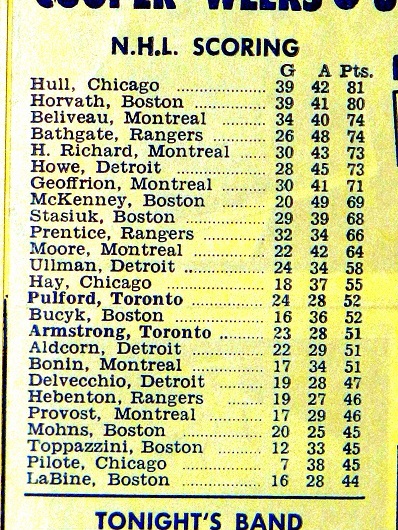 4 FOR THE BRUINS THE YEAR BEFORE BOBBY ORR ARRIVED IN THE NHL. 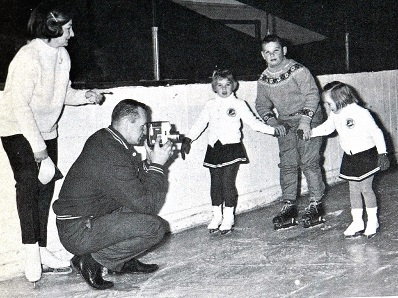 JOHNNY BOWER AND FAMILY DURING THE LEAFS’ 1965 CHRISTMAS SKATE AT MAPLE LEAF GARDENS. 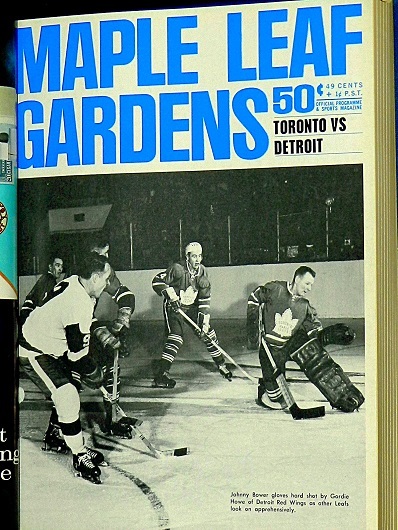 THIS GAME OCCURRED 13 NIGHTS BEFORE THE CASSIUS CLAY/GEORGE CHUVALO HEAVYWEIGHT FIGHT AT MAPLE LEAF GARDENS. 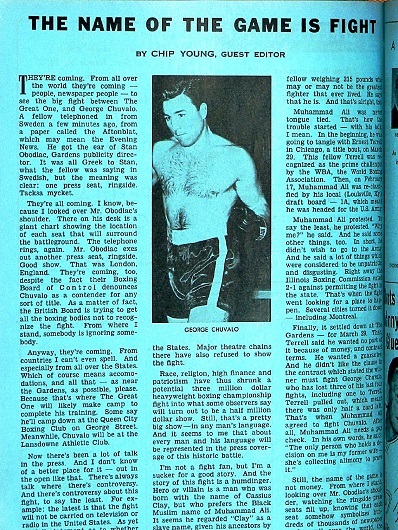 CLAY (OR MUHAMMAD ALI) WON A UNANIMOUS DECISION OVER THE CANADIAN CHAMP ON MAR. 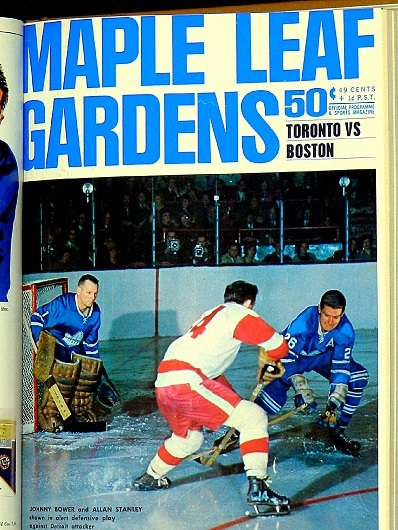 29, 1966. 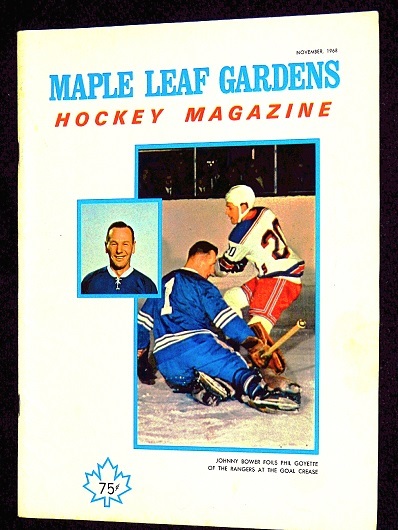 GAME 4 OF THE ’67 CUP FINAL: MONTREAL HAMMERED THE LEAFS, 6–2, TO EVEN THE SERIES AT TWO GAMES APIECE. 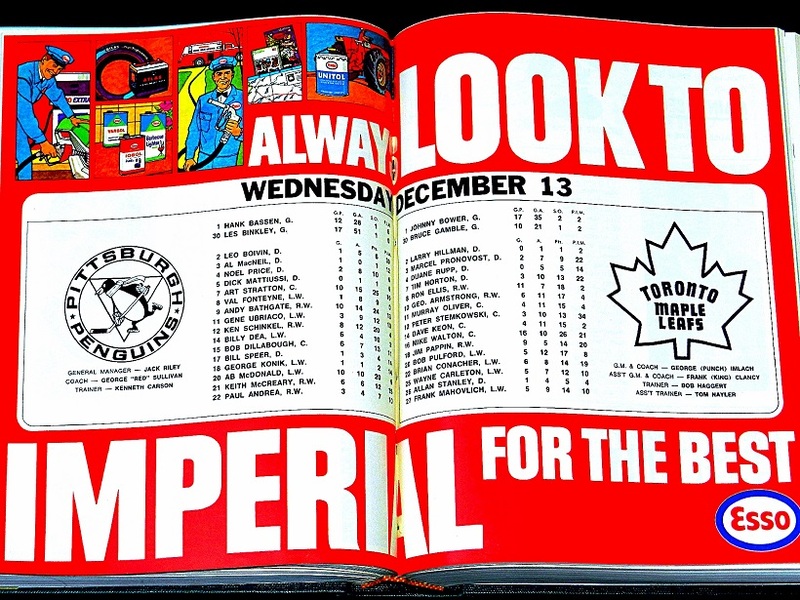 TORONTO WOULD PREVAIL IN THE FOLLOWING TWO MATCHES TO WIN THE NHL CHAMPIONSHIP. 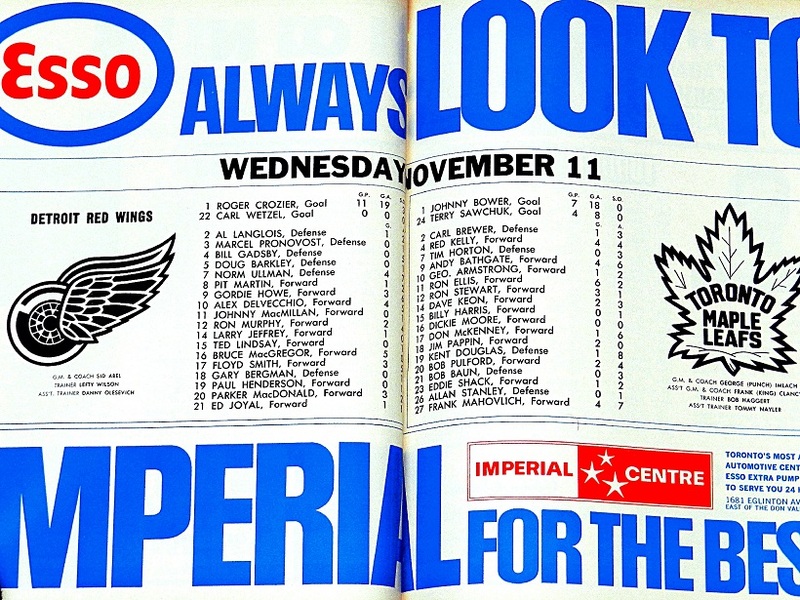 THE NORTH STARS FIRST VISIT TO MAPLE LEAF GARDENS IN THE EXPANSION SEASON OF 1967–68. 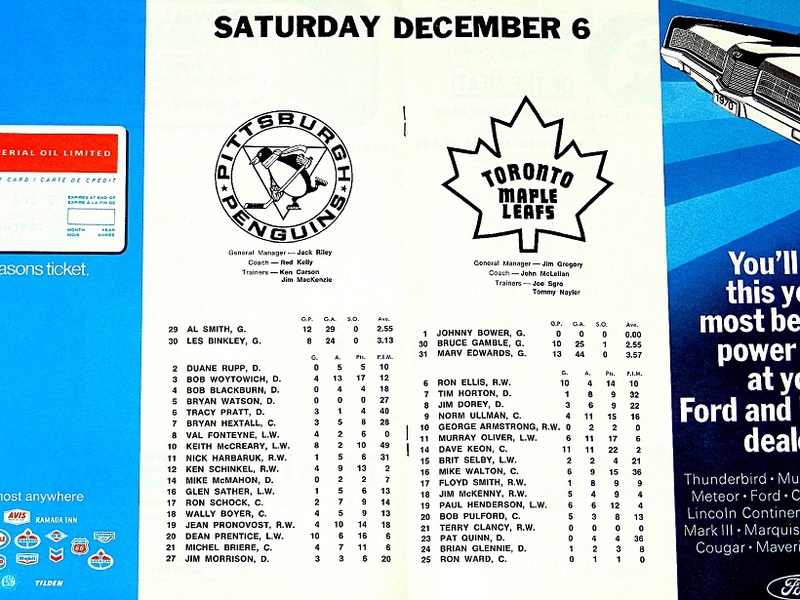 THE PENGUINS FIRST–EVER VISIT TO TORONTO. 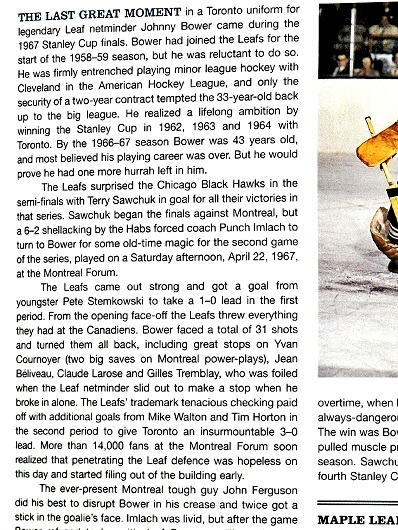 Bower’s last game dressing as a goalie at Maple Leaf Gardens. 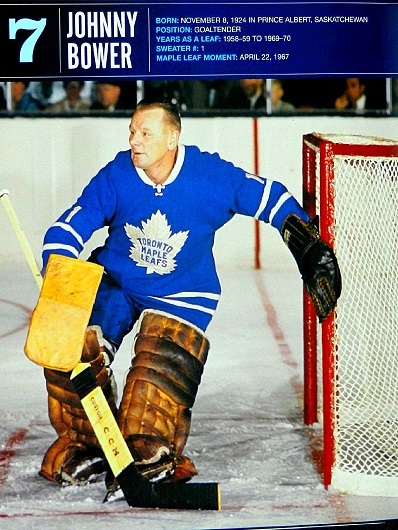 BOWER DRESSED FOR THE LEAFS THE FOLLOWING NIGHT (DEC. 7, 1969) AT PITTSBURGH, THEN APPEARED IN HIS LAST NHL GAME, THREE NIGHTS LATER, AGAINST THE CANADIENS IN MONTREAL. 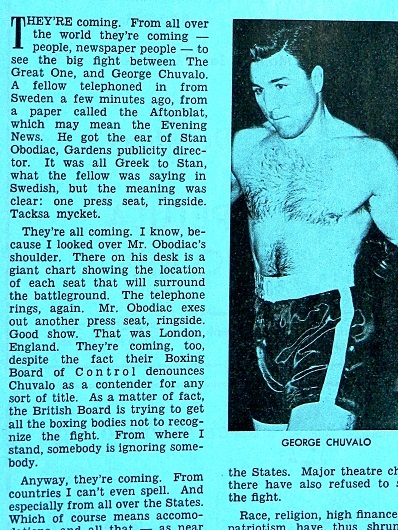 HE OFFICIALLY RETIRED IN FEBRUARY 1970. 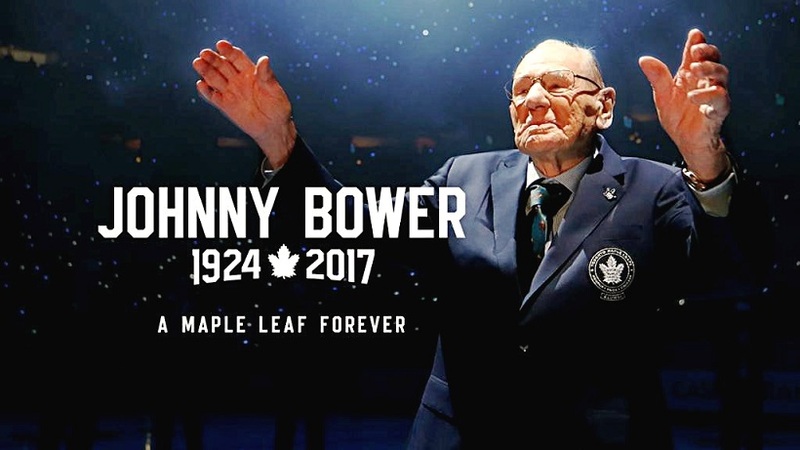 As a life long hockey fan and someone who remembers watching Johnny Bower play, your post brought back a lot of great memories. 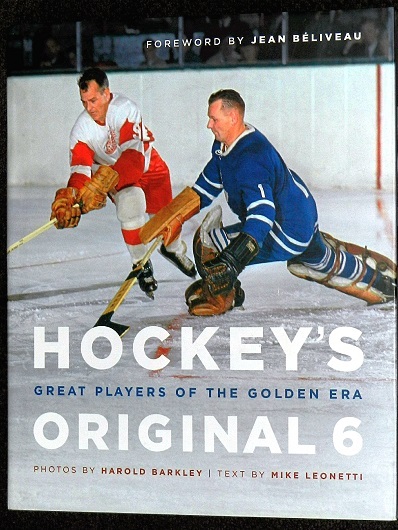 Having been a goaltender myself in the days of leather pads and smaller equipment I tried to fashion my game after guys like Bowers and his contemporaries. 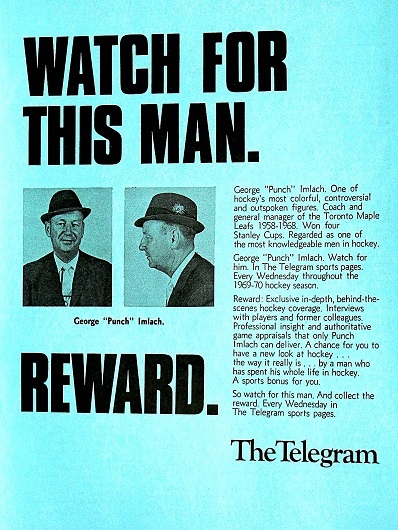 The game is different now but he could teach these young guys a few things still today. 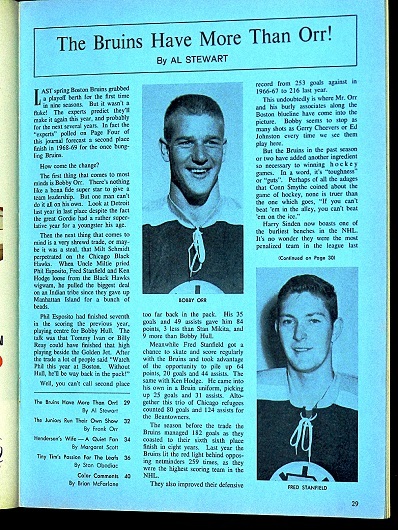 Of course as a Bruins fan I enjoyed the photos and roster pages. 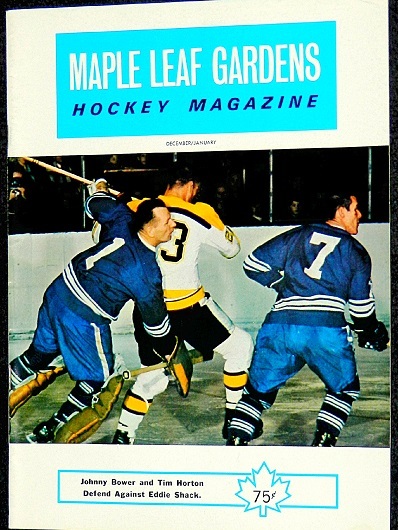 I especially like the photo with Bobby Orr with Teddy Green (#6 with the helmet on). 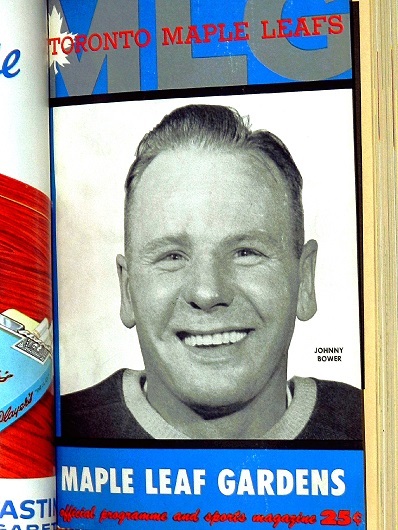 You don’t see many pictures of Teddy. 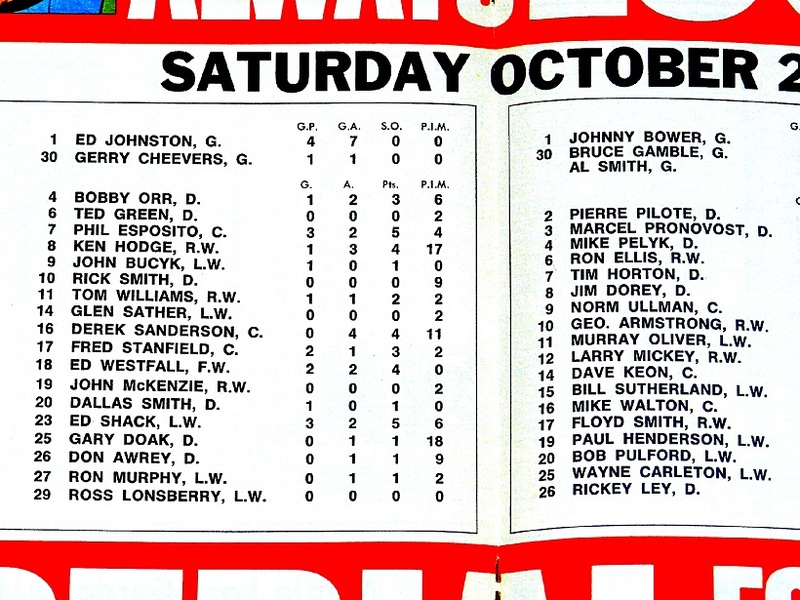 Also seeing Murray Oliver’s name in the lineup, I had an autographed stick of his years ago. 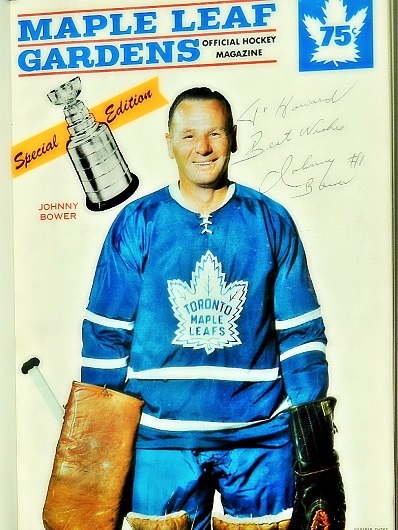 Thanks again for the trip down memory lane and the fitting tribute to a great man Johnny Bower!